Are you in need of Administrator or Evaluator training? We have two unique opportunities scheduled for January and February. Register today for the January 24 & 25 classes to be held in Bellevue, Washington. 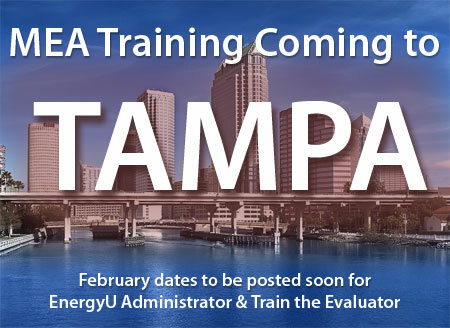 If you can’t make our January training, please join us in Tampa, Florida in February. The dates will be finalized and published soon, so stay tuned! Please be aware that the MEA Evaluator Renewal online training course has been updated. This update requires the course to be reset in order for a new score to be registered. Every 36 months qualified MEA evaluators have the option of attending an in-person evaluator class or taking the online course. Please make sure users understand that they must have a status of Not Started in order to receive a score. Users passing the online course will earn certificate MEA11995.